Most people don't pay a monthly premium for Part A if you have worked for 10 Years or 40 Quarters. If you have to buy Part A, you'll pay up to $422 each month. If you paid Medicare taxes for less than 30 quarters, the standard Part A premium is $422. 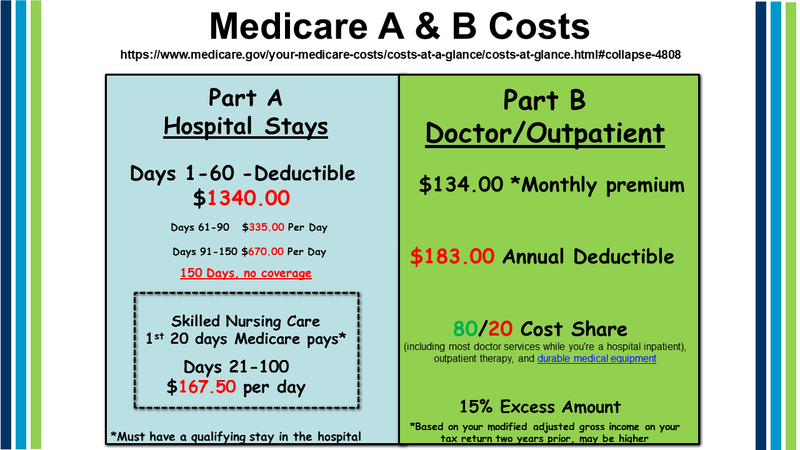 If you paid Medicare taxes for 30-39 quarters, the standard Part A premium is $232. The standard Part B premium amount is $134 (or higher depending on your income). However, some people who get Social Security benefits will pay less than this amount ($130 on average). After your deductible is met, you typically pay 20% of the Medicare-approved amount for most doctor services (including most doctor services while you're a hospital inpatient), outpatient therapy, and durable medical equipment.